Ruins of a Canaanite city and fortresses dated to the Iron Age II period (Israelite Kingdom), on a ridge at the crossing of the Jordan valley and Tirza (Farha) valleys. 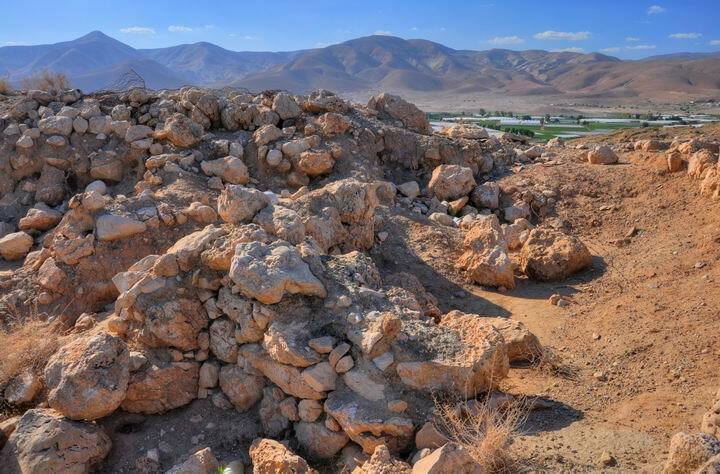 Ruins of a large Early Bronze Canaanite fortified city and fortresses from the Israelite Kingdom period. The site is located on a broad ridge, at the crossing of the Jordan valley and Tirza (Farha) valleys. The ruins date to the Early Bronze age and the Iron age II, which were damaged by modern (IDF) fortifications. 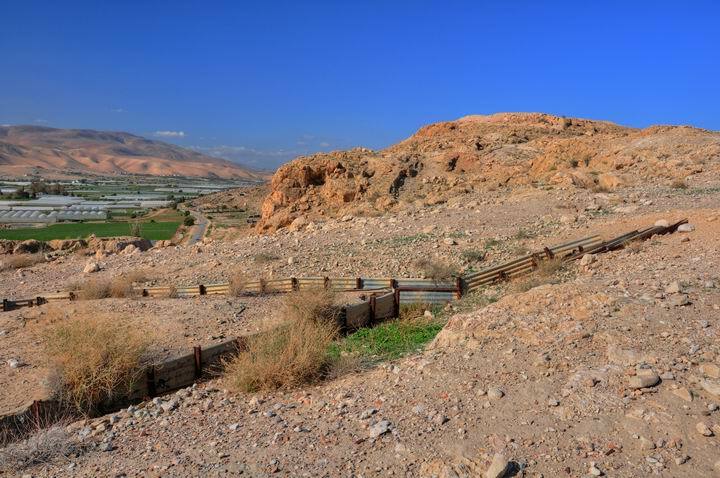 The site is located at a height of -247m, 30m above the valley surface, and covers 45 Dunams (11.25 acres). An aerial photo of the area around Khirbet Makhruk is shown below, indicating the major points of interest. You can point on the purple points to navigate to the selected site. 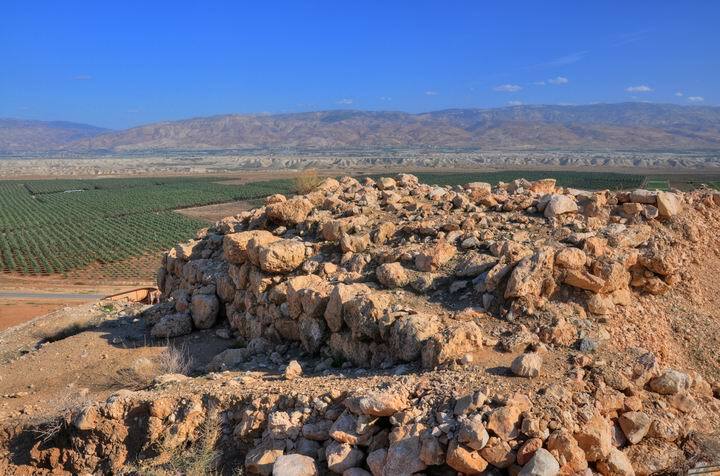 During the Early Bronze age a fortified city covered most of the area of the ridge. The shape of the walled city was triangular, with the head of the triangle pointing north. 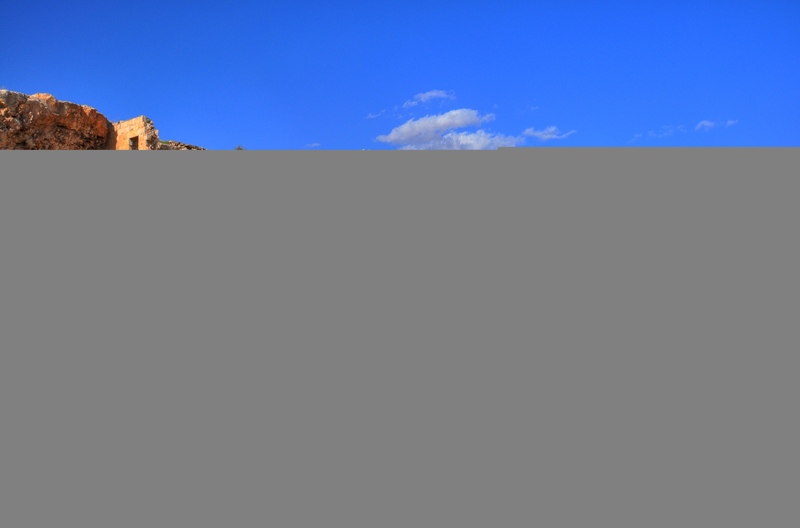 A square fortified structure, dated to this period, was located on the highest edge of the fortified city. 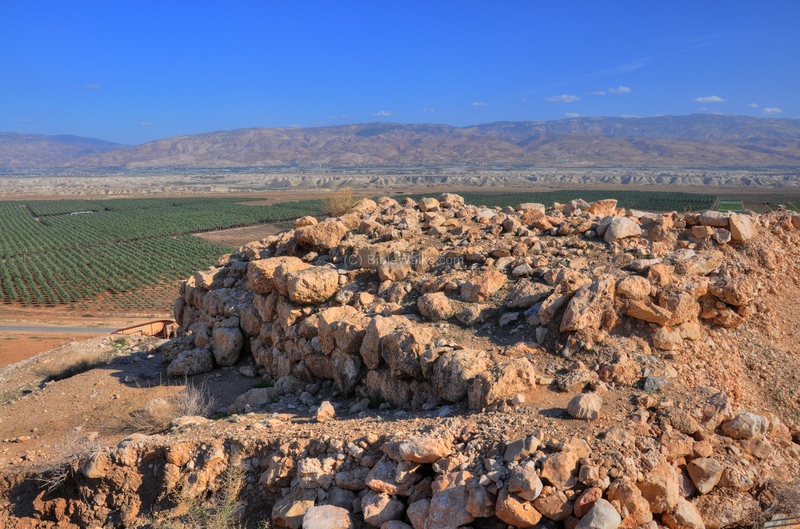 During the Israelite Kingdom, a rectangular fortress was rebuilt on the eastern hill and a circular tower in the southern part of the ridge. 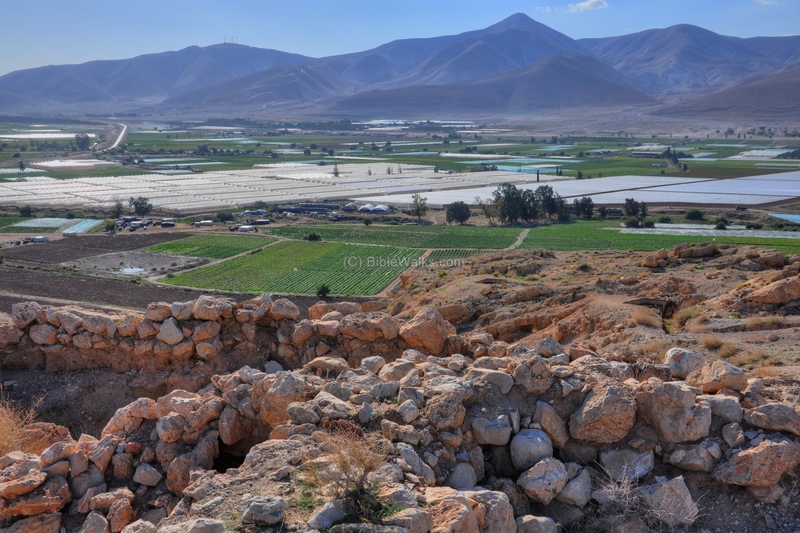 These fortifications served as a road fortress that protected the westward roads to the heart of the kingdom - Samaria. 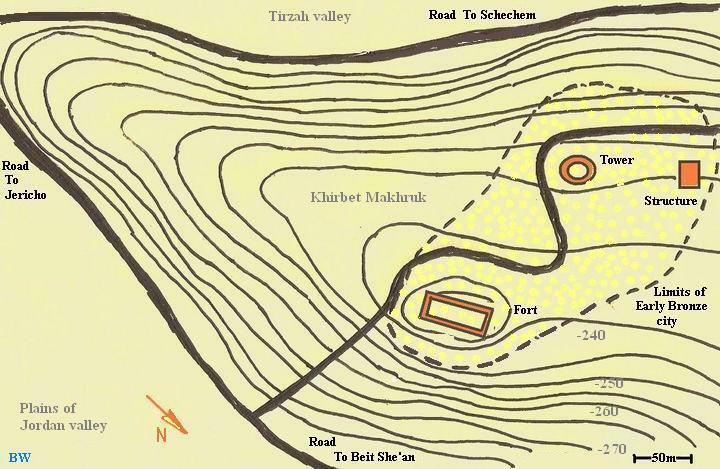 According to Israel Guide (Judea/Jordan valley section, p286) the fortifications may have been conducted by Jeroboam, the first King of Northern Israelite Kingdom, in order to protect the route to the frontier city of Penuel, on the northern bank of Yabok (Zarka) brook, which passed at this place (1 Kings 12 25): "Then Jeroboam built Shechem in mount Ephraim, and dwelt therein; and went out from thence, and built Penuel". The site is located on a junction of two major roads. This was the case in ancient times as well as in the modern period. The Romans, masters of road construction, constructed a major "highway" that connected Jericho to Beit Shean (see below) and a road that connected this road and passed westward via Tirzah valley. The Peutinger Map (Tabula Peutingeriana) is a medieval map which was based on a 4th C Roman military road map. The map shows the major roads (in brown lines), with indication of the cities, and geographic highlights (lakes, rivers, mountains, seas). Along the links are stations and distance in Roman miles (about 1.5KM per mile). 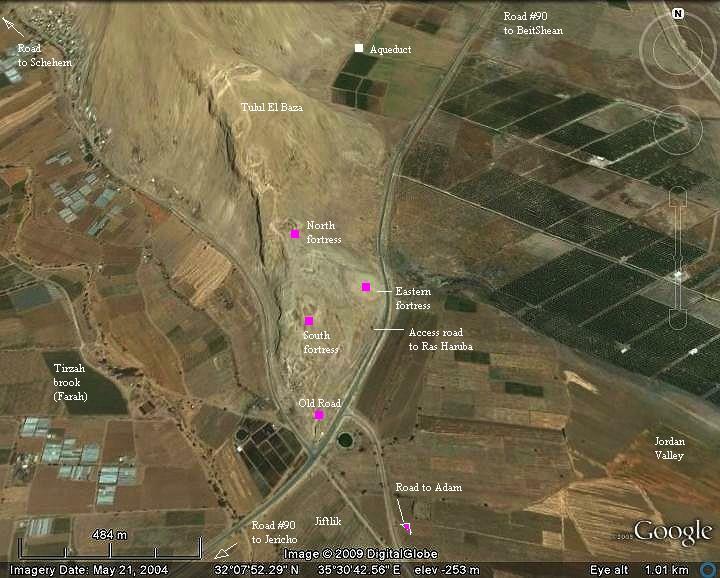 In this section of the map is the area of Jordan valley, drawn in a rotated direction (Dead sea is on the left; Sea of Galilee is the right). 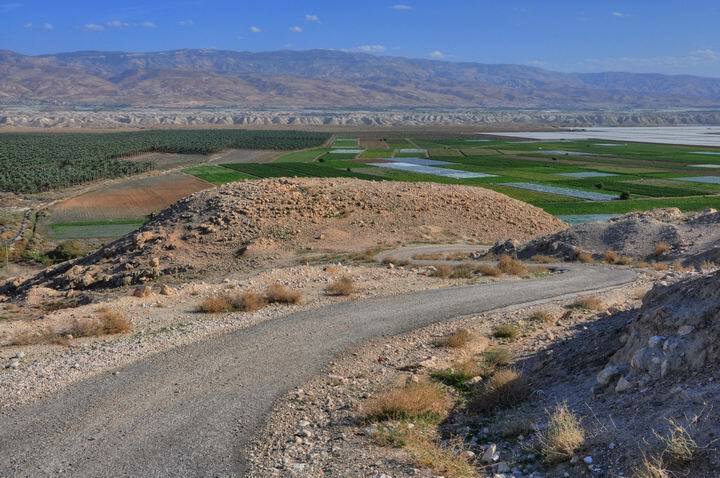 The major Roman road in the Jordan valley connected Beit Shean ("Scytopoli") and Jericho ("Herichonte"). The red square marks the place of Khirbet Makhruk, in the middle between theses major cities. 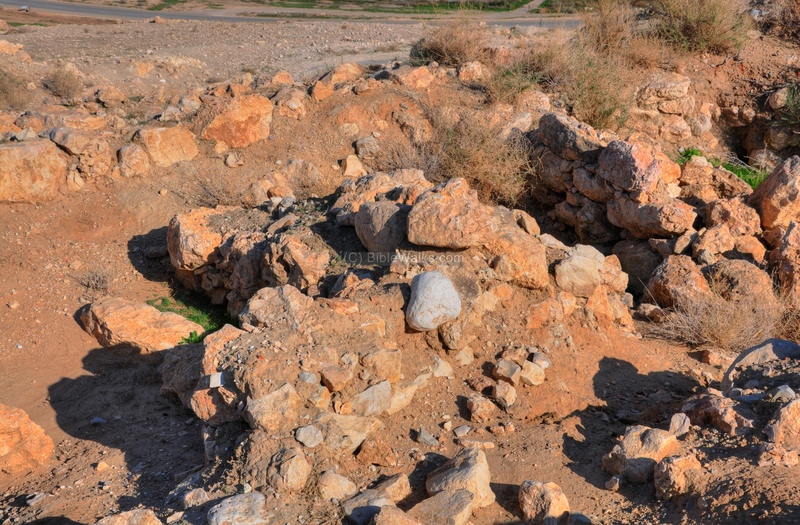 The site was damaged by modern armies; fortifications constructed by the Israeli Defense Forces (IDF). 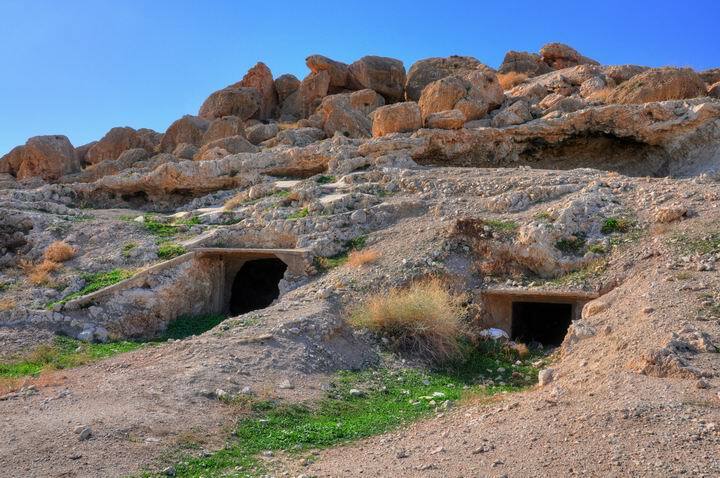 Communication lines and trenches were built into the circular and square towers, and in other parts of the ridge. The site is an open area today, and is easily accessed. 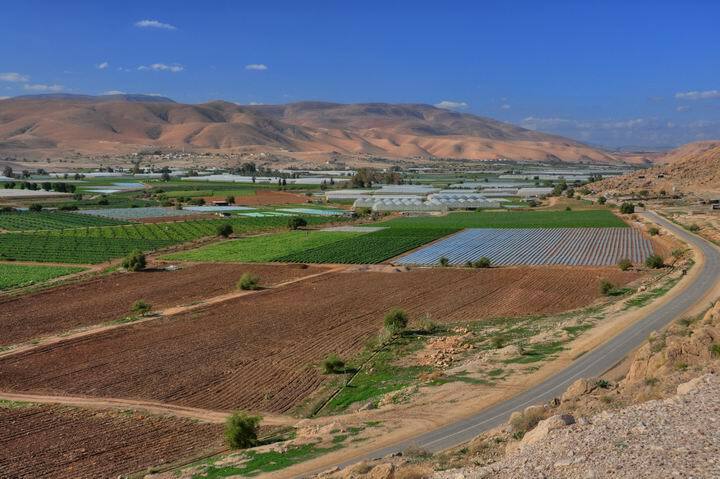 It is recommended to make a stop here, visit the site, and enjoy the views of the Jordan and Tirzah / Far'ah valleys. A diagram of the site is shown below (based on Manasseh Hill country survey), with indication of the position of the rectangular fort, circular tower and square structure. 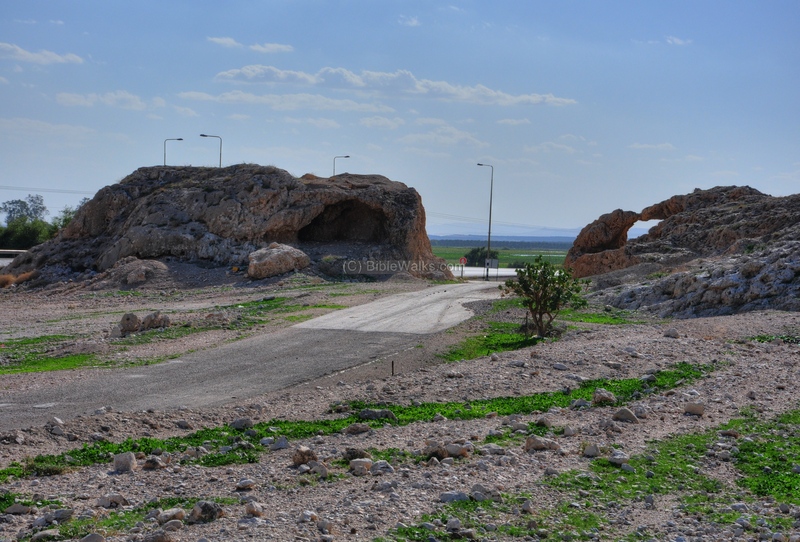 A paved road traverses the ridge, and continues on to the top of the ridge (Ras El Harubeh, a view point at a height of +211m, with great views of the Tirzah valley). You can point on the points to navigate to the selected site. A drone captured views above the site in Feb 2016. 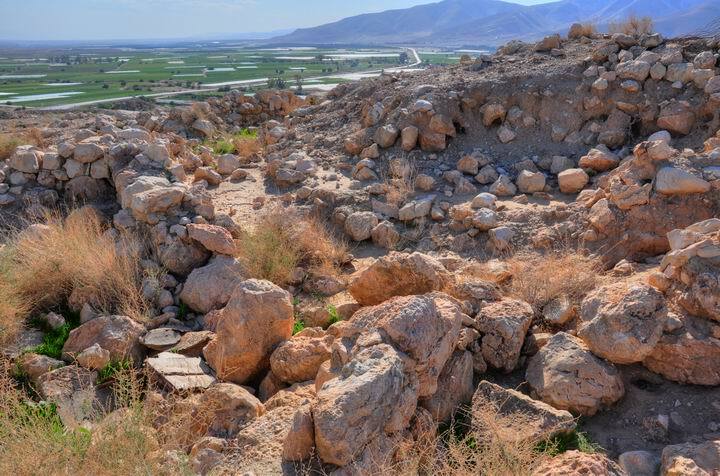 The eastern fortress is located on a hill, in the center of the view, just above road #90 (Beit Shean to Jericho). The green farming areas, in the plains of the Jordan valley, are on the right (east) side. 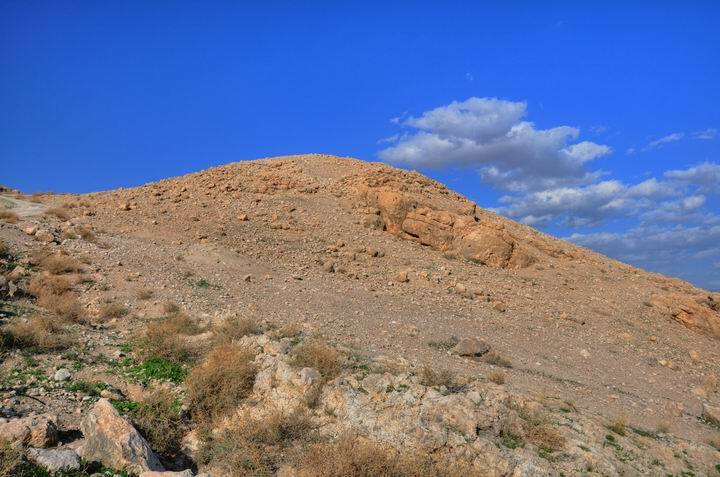 An access road climbs up to the top of the ridge, passing near the circular tower and the square structure which are located up the road. 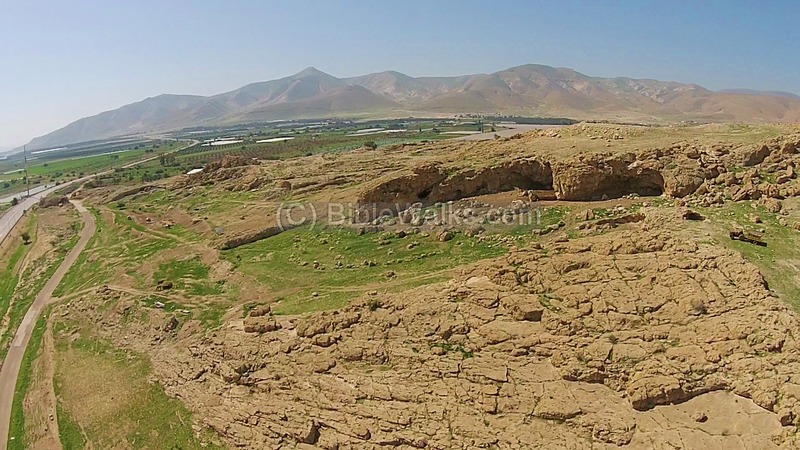 A drone from a photo above the eastern side of the site captured this photo, with a view towards the south. 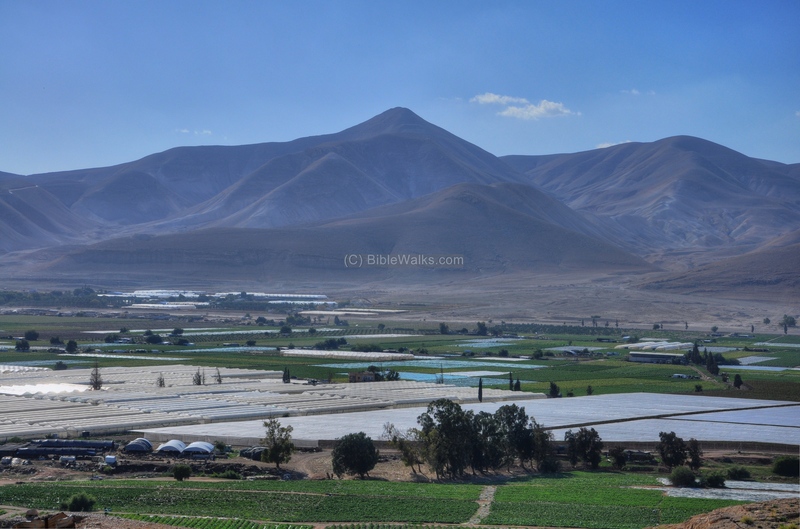 The green valley of Tirzah is seen behind the hill, and leads to the right towards Shechem. 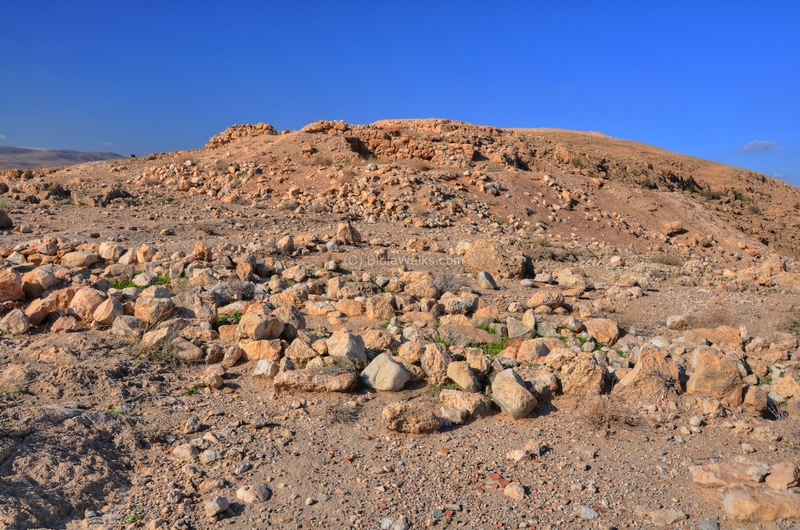 The fortified hill of Sartaba, a pointed hill that towers above the mountains on the south side of the entrance to the valley, is in the center background. The old north-south road passed at the southern edge of the ridge. The new #90 road was relocated slightly eastwards, as seen on the left side. 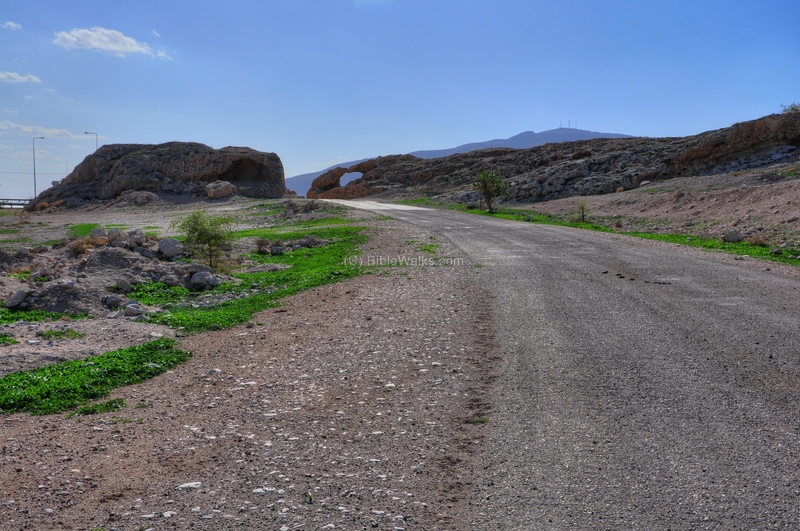 The photo below shows a closer view of the rock formations on both sides of the old road. 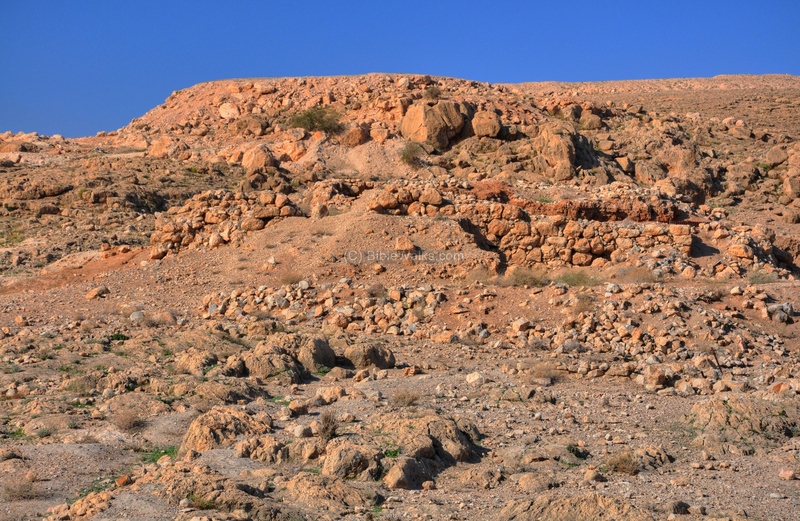 This split rock formation may have given the name of the site - el-Makhruk means "perforated" in Arabic (according to Z. Vilnai). 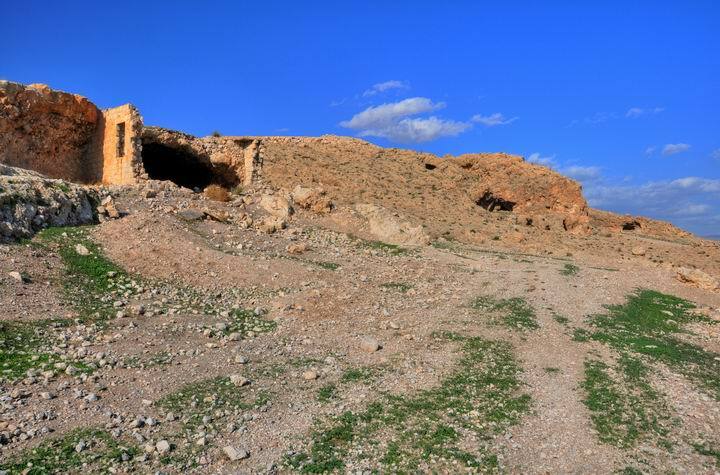 The eastern side of the ridge is pocketed with caves and traces of ruins. Below is a closer view of modern fortifications in the caves along the eastern side. 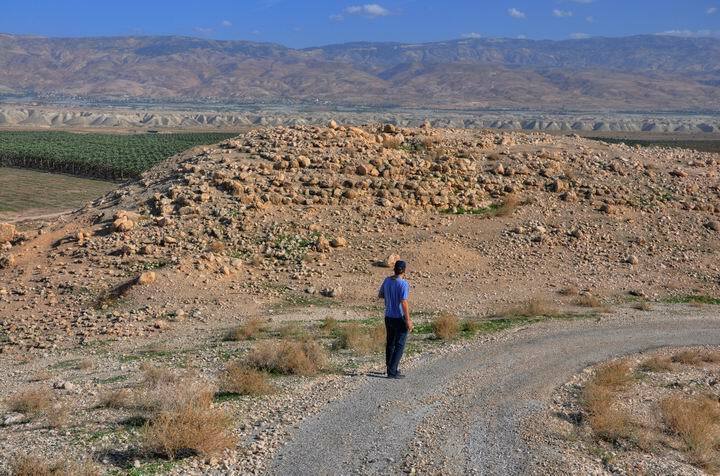 This was the site of the Ottoman's 53rd division headquarters in WW1 (1918), and the British managed to capture it during its offensive in Israel on their attack towards Jordan. The photo below - another view of the eastern side. The road on the south side of the ridge is an ancient route from the Jordan to the heart of Samaria. 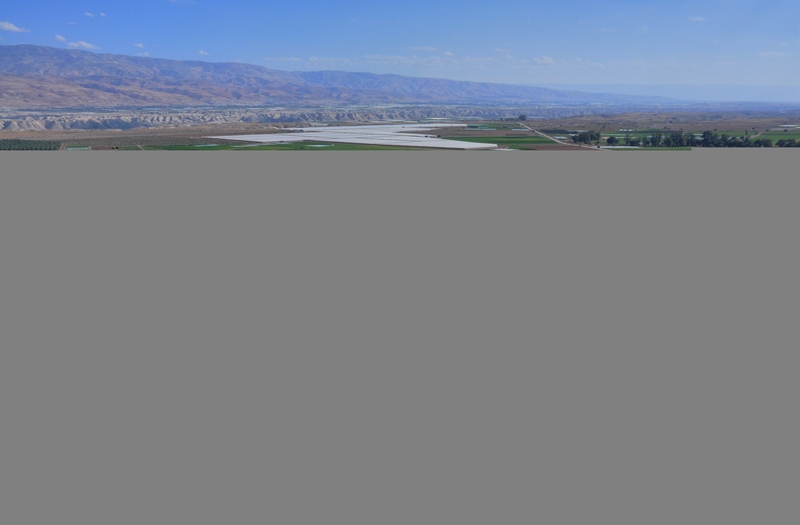 This is the valley of Tirzah (Far'ah). "And these are the kings of the country which Joshua and the children of Israel smote... the king of Tirzah"), and then it became Israel's Kingdom first capital city (1 Kings 15 33: "In the third year of Asa king of Judah began Baasha the son of Ahijah to reign over all Israel in Tirzah, twenty and four years"). 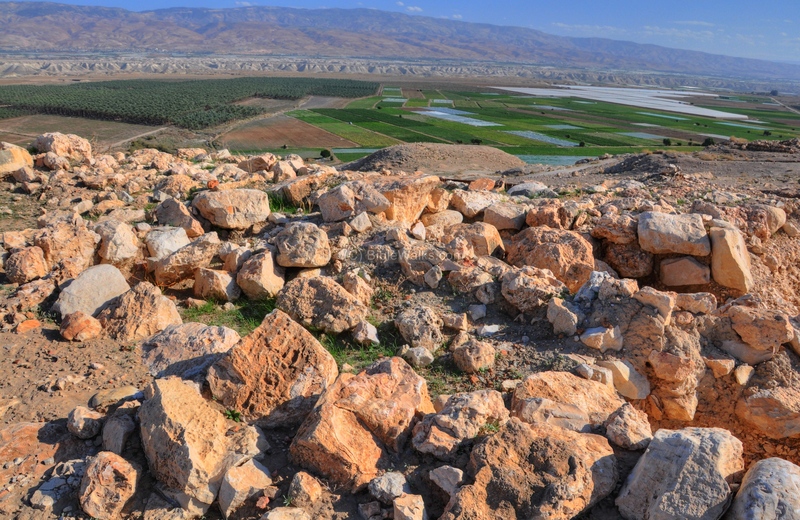 The pointed hill is the place of the fortress of Sartaba, identified as Biblical Zarthan. 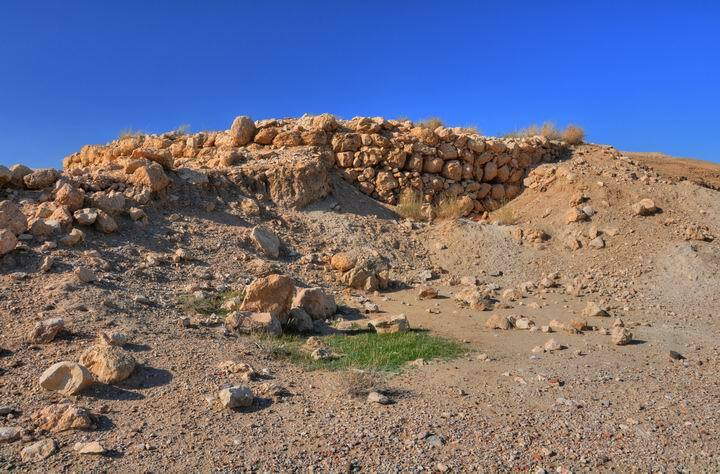 According to the Bible, King Solomon prepared Brass and Gold vessels for the temple, casting them in the clay that is located here between Succoth (plains of valley of Jordan) and Zarthan (1 Kings 7 47): "In the plain of Jordan did the king cast them, in the clay ground between Succoth and Zarthan". 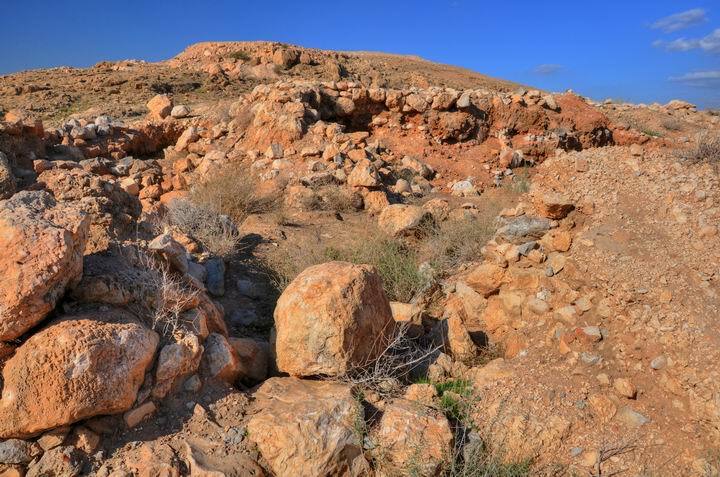 So the casting of the temple tools was done at this area. The ridge was heavily fortified in modern times, since even today it is strategically located on an important junction. The communication lines in the picture below cut through the ridge and damaged the site. A small fortress is located in the south side of the site, as marked in red on the diagram of the site. This was a circular tower, with a diameter of 12M. According to the excavator (Yeivin 1993), it is dated to the 10th-9th C BC (Iron Age II), with some underlying Early Bronze remains. The ruins of the tower is shown below from the south side. 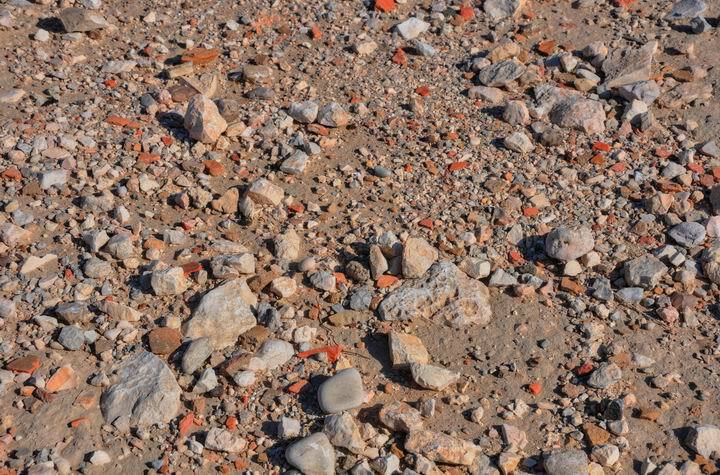 The site is covered by a blanket of red/orange ceramic fragments. The majority of these are dated to the Bronze and Iron ages with almost no later period ceramics. A closer view of the eastern side of the tower is seen below, as seen from the north side. Another view of the north-west side of the tower is seen below. The photo below shows the same view, but from the opposite angle. 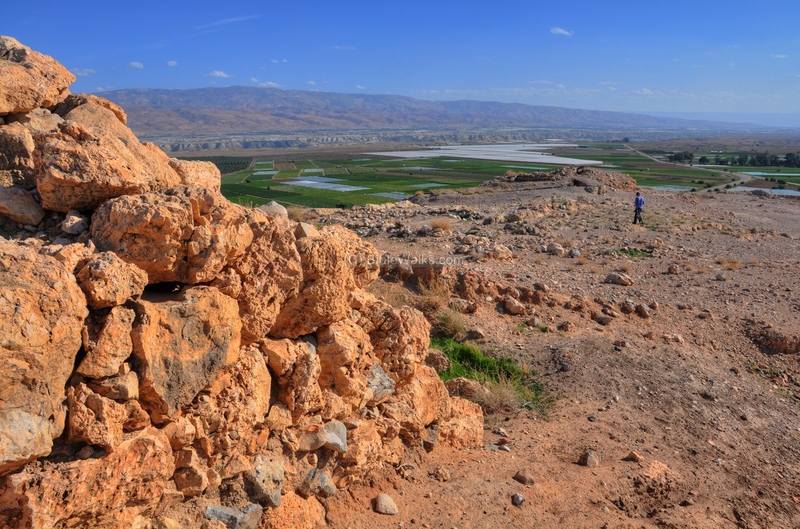 Standing on the tower, the Biblical-time watchmen could see the eastern rectangular fortress below, and a great view of the plains of the Jordan valley. The watchmen would have spotted enemy troops approaching from the Jordan and alerted the army. 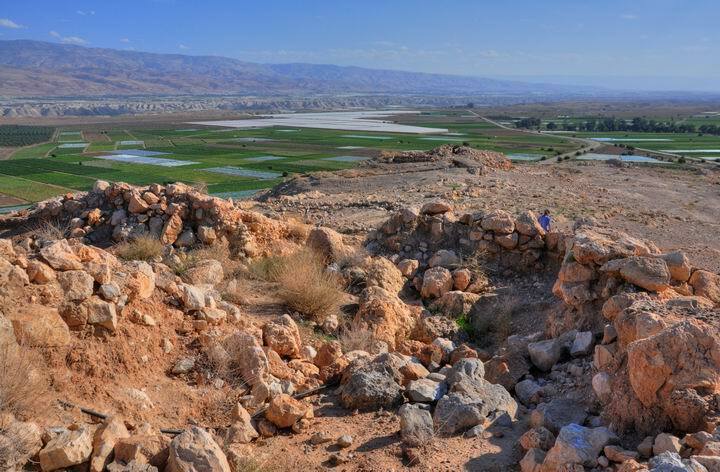 The tower also provides a great view of the road to the north and the plains of the Jordan valley. The Biblical name of this area was "Succoth". 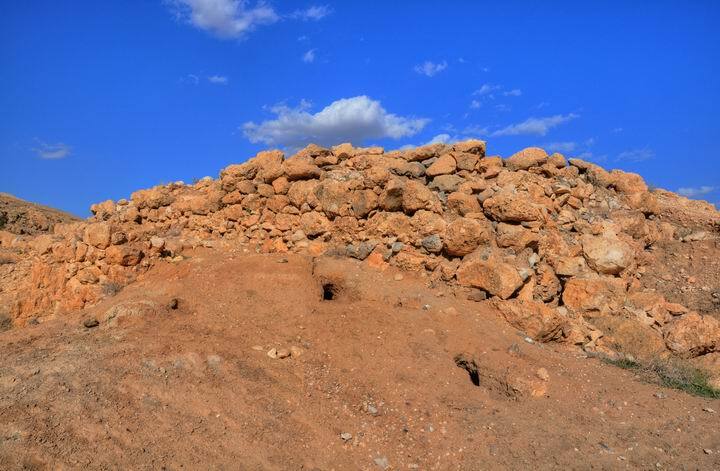 A square fortified structure was located on the highest edge of the fortified city- the north-west side. Its location inside the site appears on the diagram, marked in red. According to the excavator (Yeivin 1993), it is dated to the 10th-9th C BC (Iron Age II). The photo below shows the structure from the circular tower. Another view of the square structure is in the picture below. 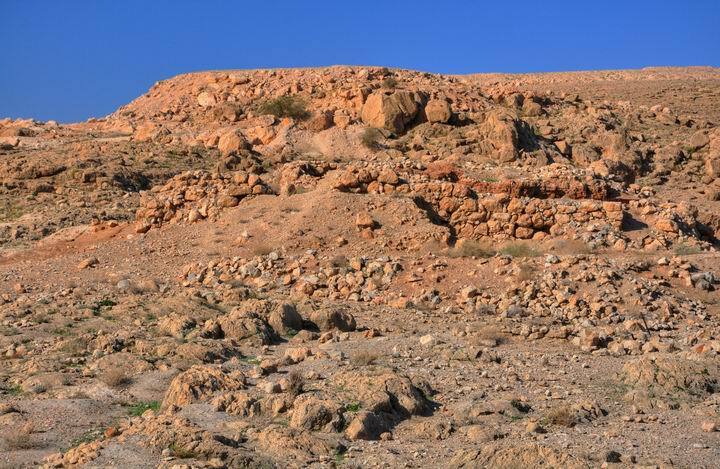 A section of the early bronze period wall stretches in front - from left to right. A closer view of the walls of this structure is in the picture below. The picture below shows the interior of the square structure. 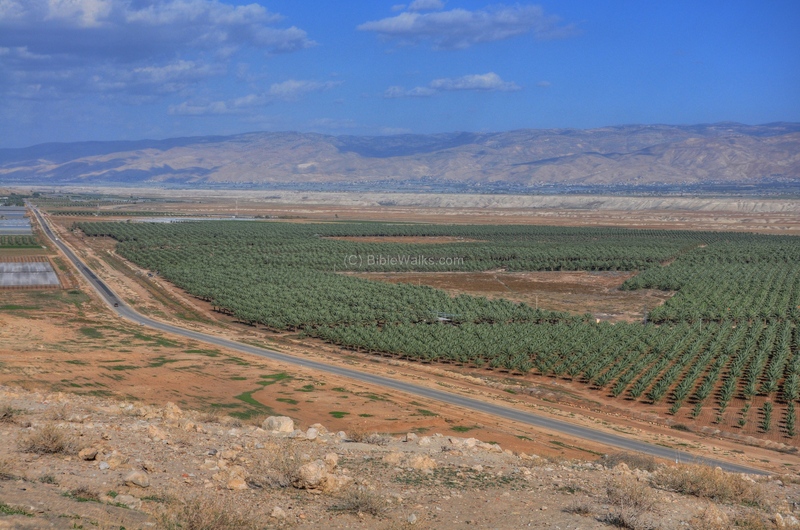 A north-east view of the plains of the Jordan valley is seen from the structure. An eastern view is shown below, with the eastern fortress in the center and the circular tower on the right. The view towards the south is remarkable. The green valley of Tirzah (Far'ah), and the high mountains of above the valley, with the pointed hill of Sartaba (identified as the Biblical Zarthan). The picture below is an eastern view, with the circular tower in the edge of the visible ridge. Yet another view is in the picture below. 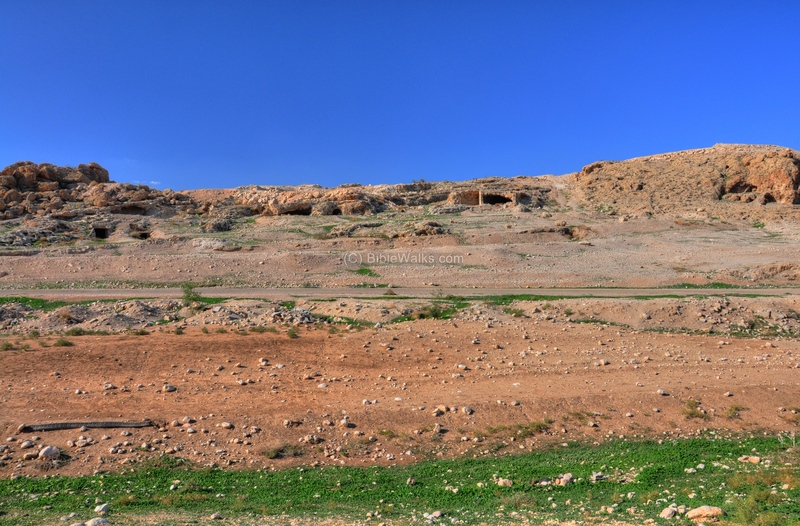 The rectangular Iron Age II fortress is located on the east side. Its location is marked in red in the diagram. The photo below shows the fortress from the west side. In the background of the photo are the plains of the Jordan valley, in the direction of Adam bridge. 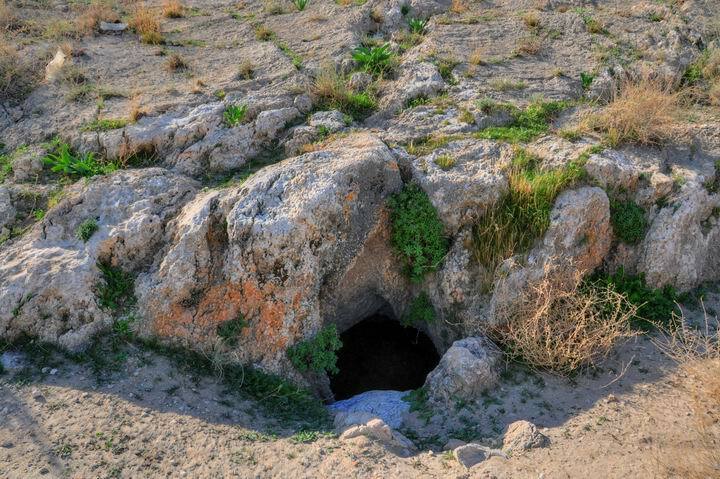 A water cistern is located near the fortress, and was part of the water supply for the city and fortress. 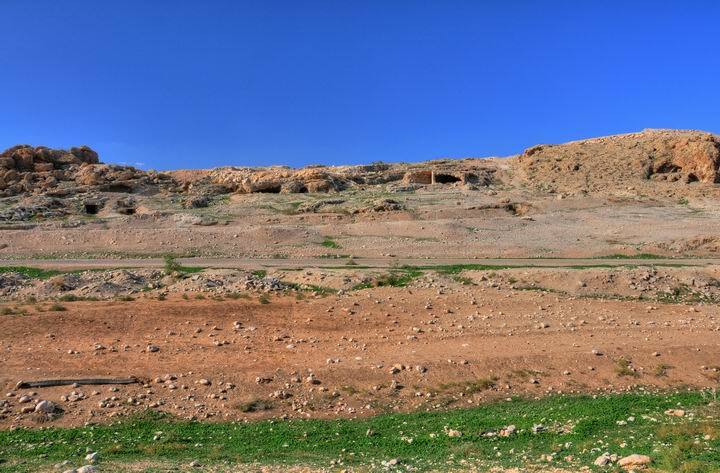 The photo below is from the north side of the eastern fortress, closer to the modern road (near the brown sign with directions to "Ras-Harubeh" - an observation point at the top of the hill). 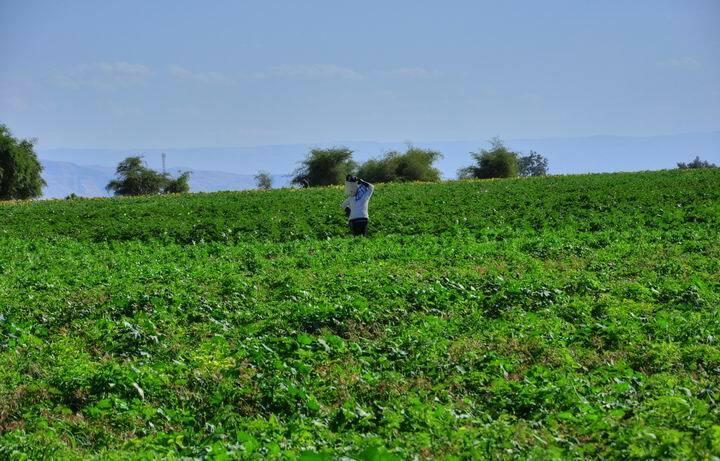 The green fields near the road present a vivid contrast to the dry light-brown soil around it. 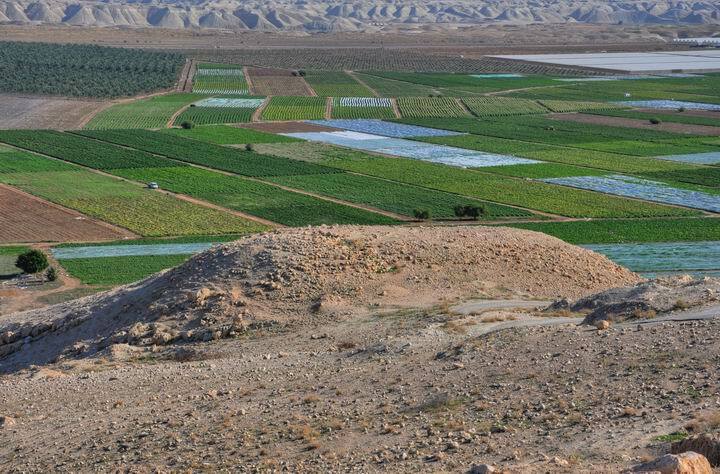 Local Arab villagers work the fields in old fashion ways - by hand. An old mine was seen near this field. 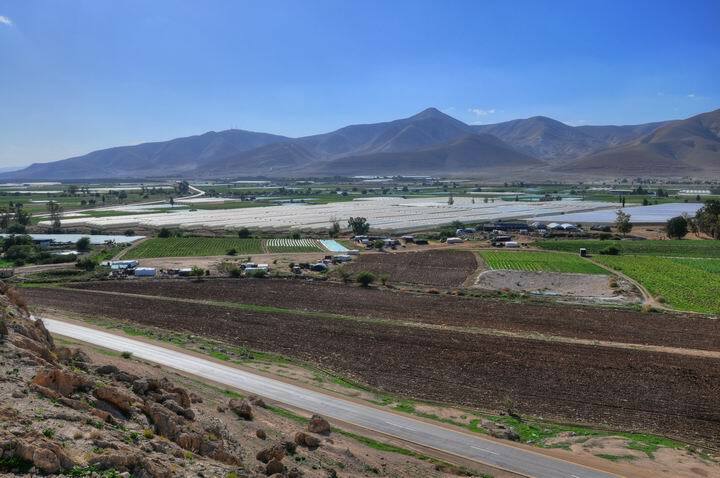 After all, the area is close to the border and is a gateway for two major crossing roads. The mine was probably found during the farming of the field, and left out on the road. 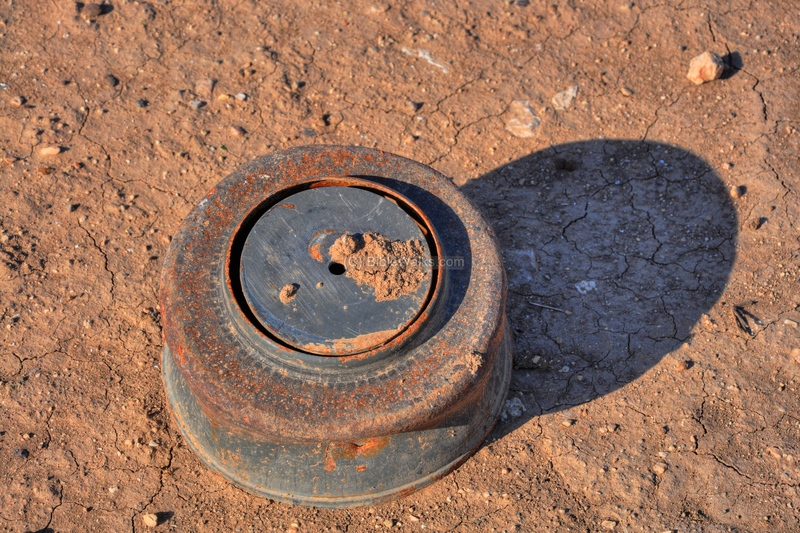 Since it is painted blue, this might be a dummy training mine, but we would not advise to touch it. Makhruk (Mahruq, Makherouk)- Arabic for "split". The name of the site, based on the split between the rocks where the road passed. Mukhrak (Muhraq) - Arabic for: "burnt" . Another common interpretation of the name of the site. 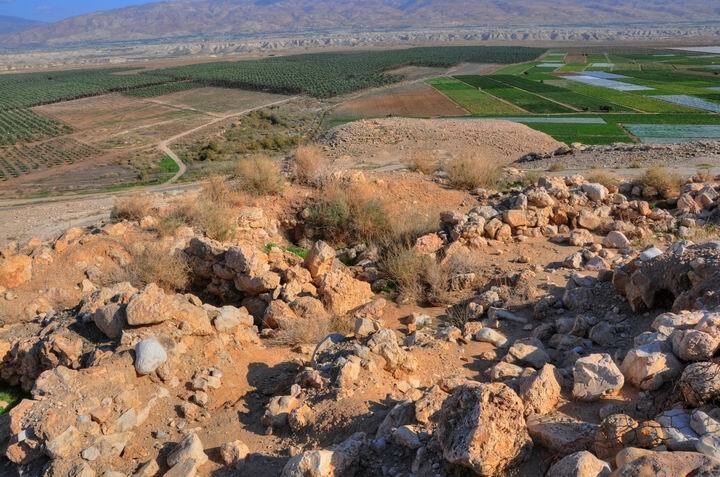 Tirzah - Biblical city in Samaria - Once a Canaanite city (Joshua 12 24: "And these are the kings of the country which Joshua and the children of Israel smote... the king of Tirzah"), and then Israel's Kingdom first capital city (1 Kings 15 33: "In the third year of Asa king of Judah began Baasha the son of Ahijah to reign over all Israel in Tirzah, twenty and four years"). Tirzah brook - The brook from Shechem to Adam. Farah - The name in Arabic of Tirzah; unknown translation. Jiftlik, Jiftliq - Turkish: The Sultan's estate. There were many such estates, one located south-east of Makhruk.